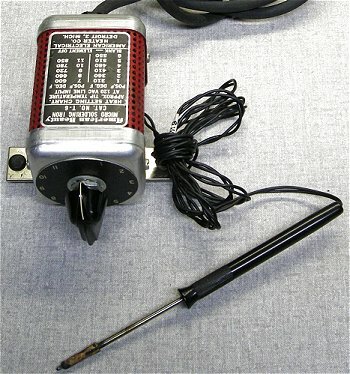 temperature control, or plugs into any type of base. This early electric soldering machine used a pencil carbon and copper tweezers to pass current through the item being soldered. 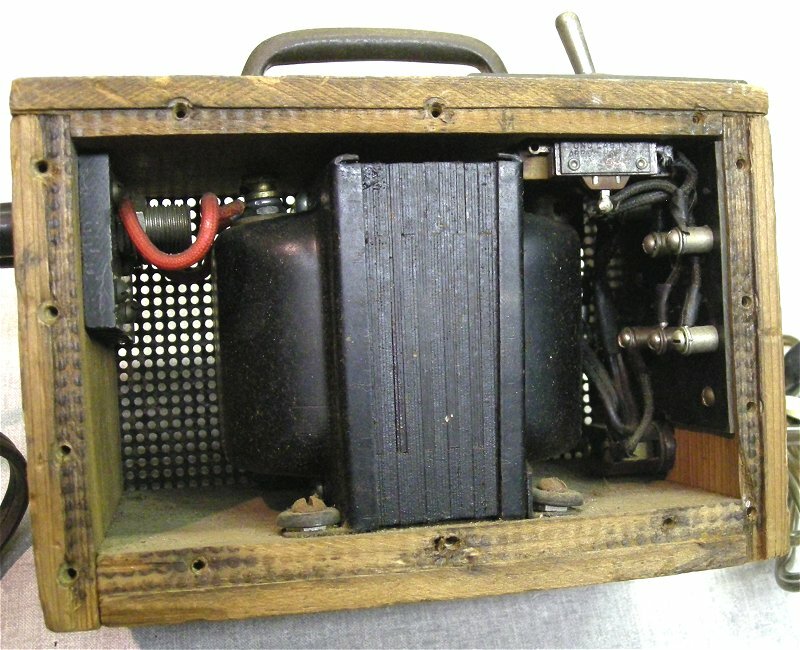 The large transformer housing has five levels of voltage selected by the large knob and brass contacts on the front. 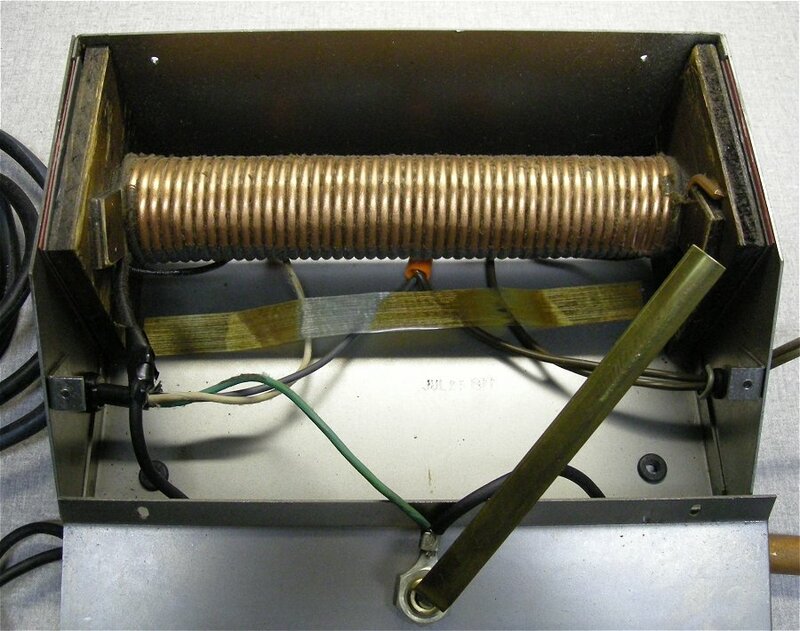 Current is turned on and off using screw contacts inside the spring loaded wooden foot pedal. The pencil carbon shown in the holder is not original but it fits exactly so I am guessing the original would have been similar. 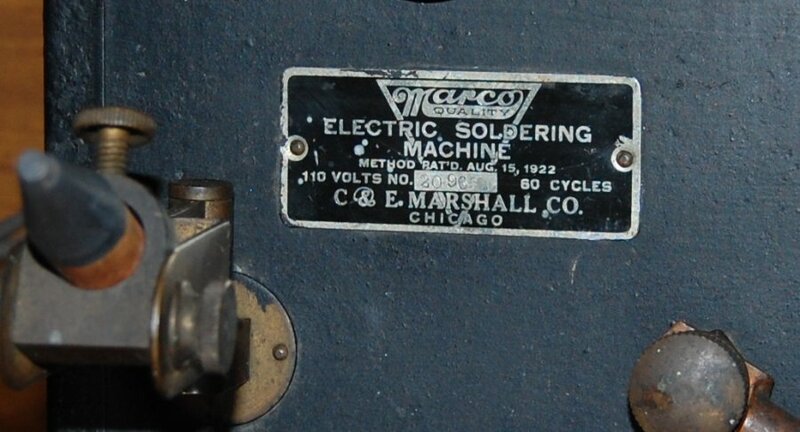 It was manufactured by the C & E Marshall Co., Chicago sometime after 1922 as there is a patent date on the nameplate of August 15, 1922. I have not found any additional information on it. In December of 1926 William Alferink filed a U.S. patent for a "Combined Holder and Automatic Circuit Breaker for Electric Soldering Irons". 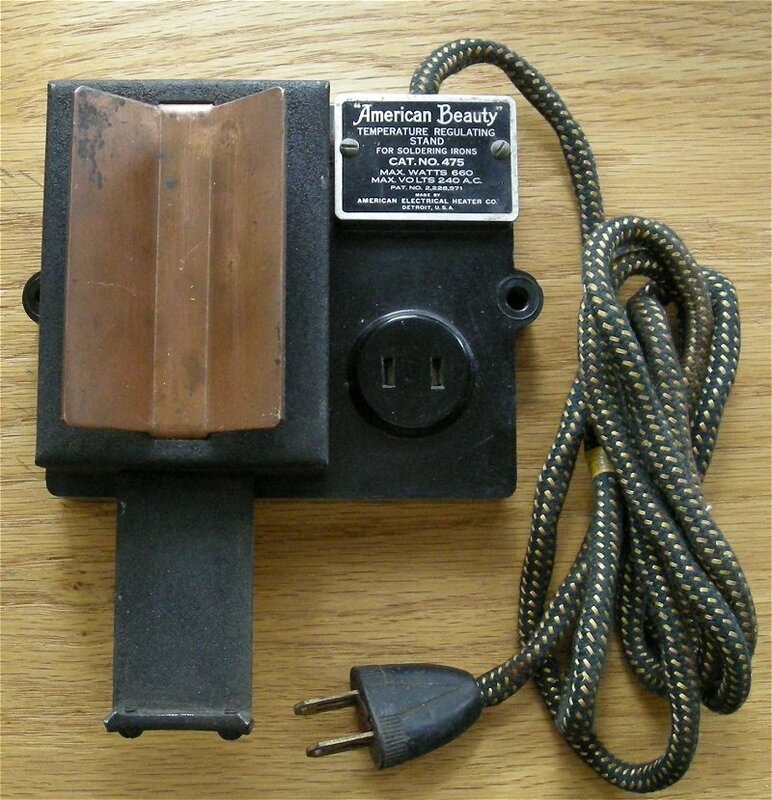 On July third, 1928 his patent was granted. 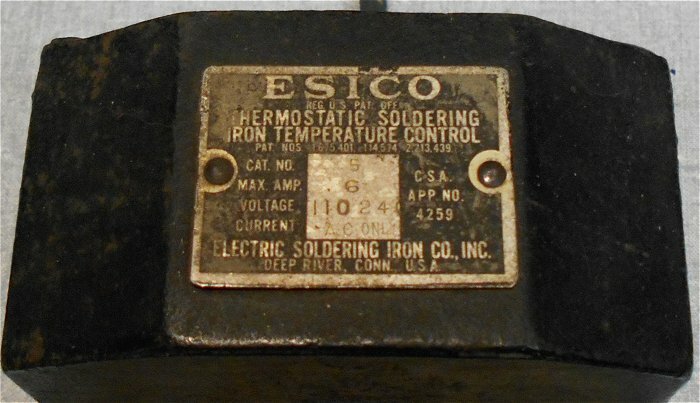 This is the earliest patent I have found directly relating to temperature controled soldering stations. 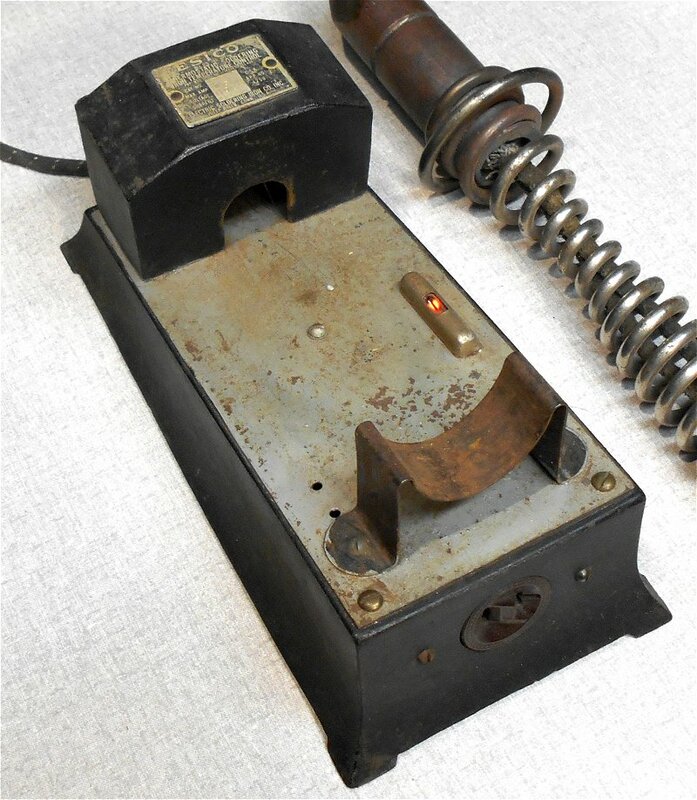 This soldering iron stand has a bakelite base and thermostat with an adjustment (on bottom) to regulate the temperature of any iron plugged into it. 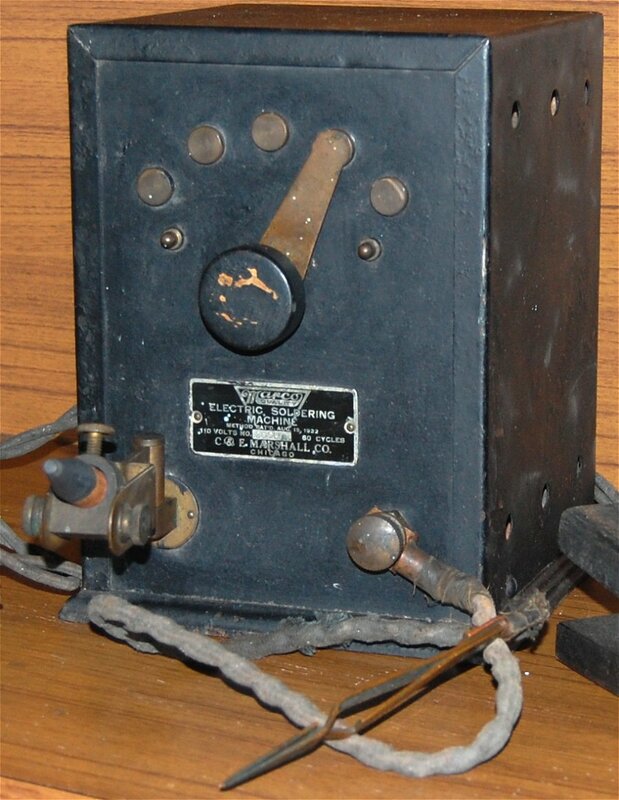 Patent # 2,228,571 was applied for on April 10, 1939 and granted on January 14, 1941. 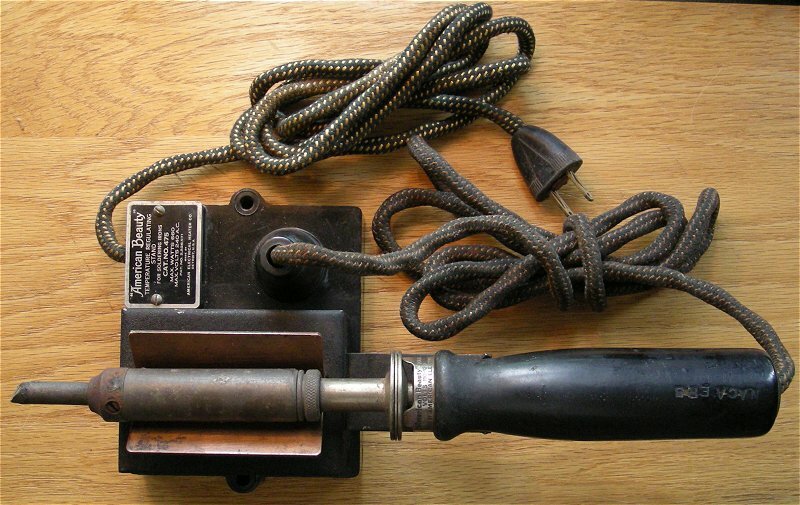 This unique wall mount soldering station was made for Bell Telephone by Vulcan Electric Heater Corporation, New York. 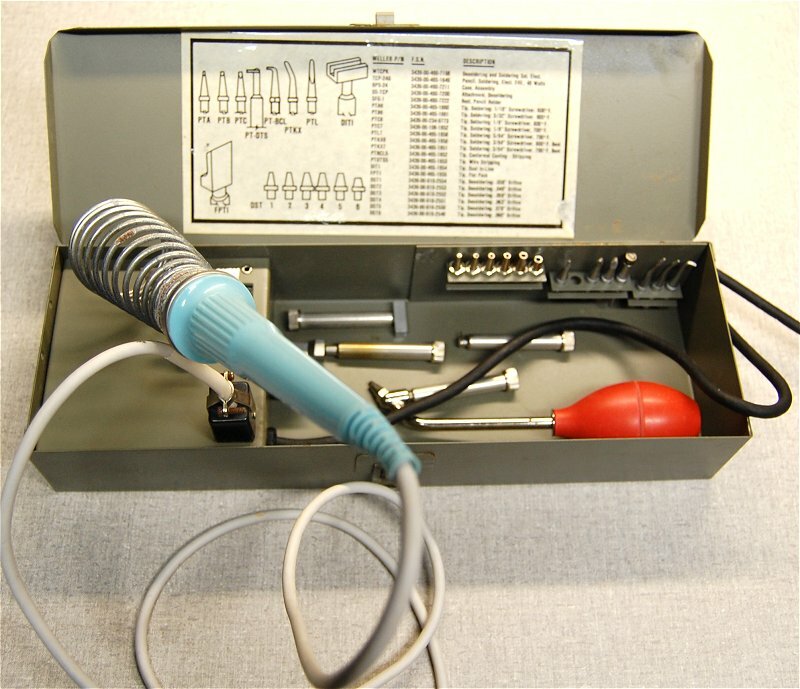 It has two removable soldering irons. 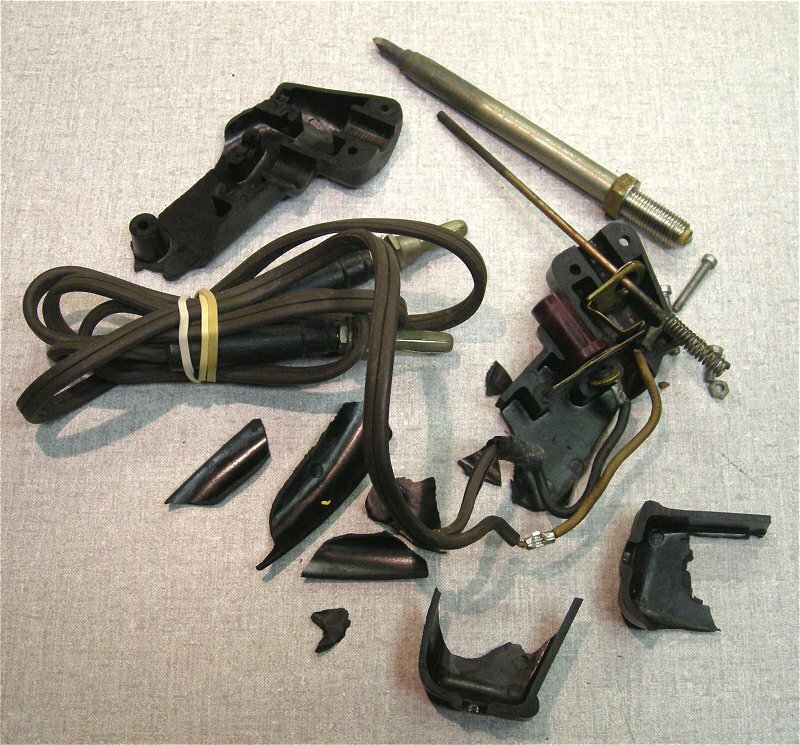 The technician would remove and use one until it cooled and then put it back and use the second iron while the first iron reheats. The switch at the top turns on the station and the lamp underneath the switch indicates the irons are heating. 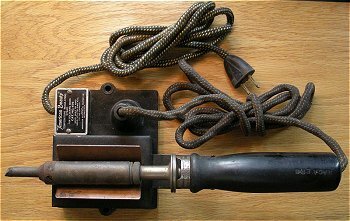 Both irons have a two conductor post on the back of the handle that makes contact with the AC supply when they are snapped in place. The irons are a little over 16 inches in length. The station is about 27 inches high and 8 inches wide. 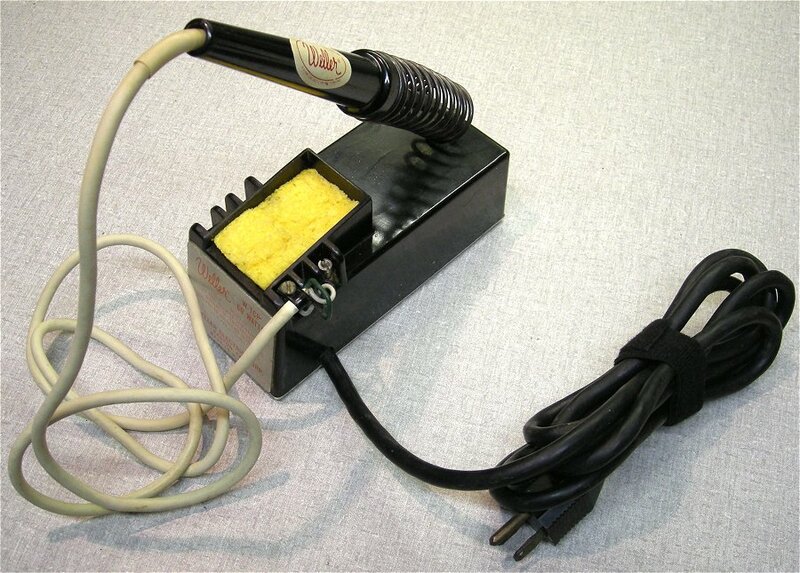 This Soldering Iron Temperature Control regulated any electric soldering iron by plugging the iron into the base and placing tip into the hole in the housing. 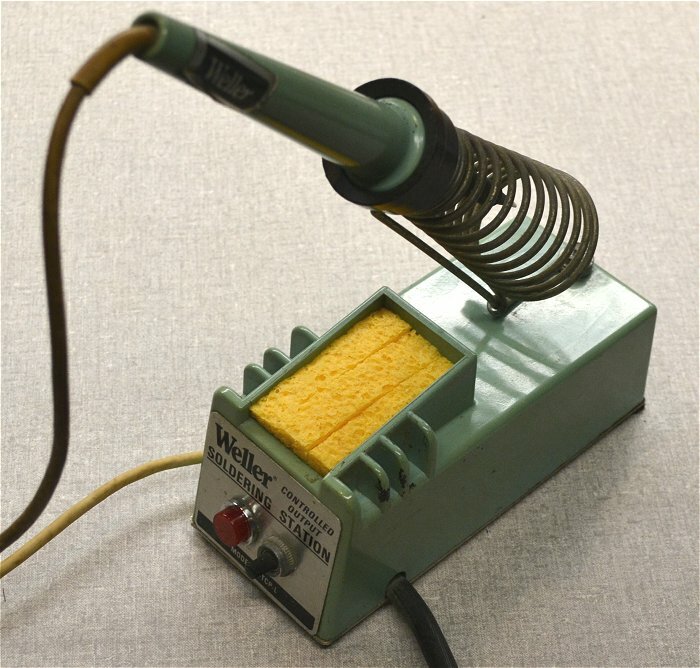 A metal strap would then heat and expand breaking an electrical contact in the base. 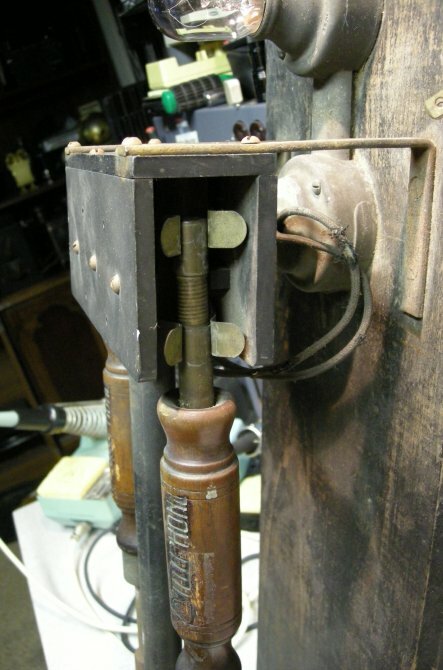 The temperature was controlled by adjusting a screw while moved the contact closer or further from the metal strap. 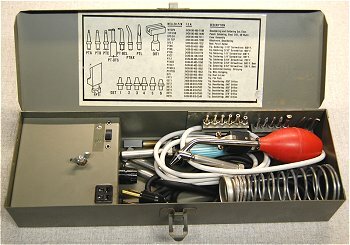 I will classify this small soldering iron as a soldering station as it has a transformer housed in a small (2"x2"x3") metal housing with a 12 position switch to select different transformer taps for temperature. the tiny 6" iron is made by Oryx of England. It is an interesting unit but due to the low power, it is only good for tiny soldering jobs. 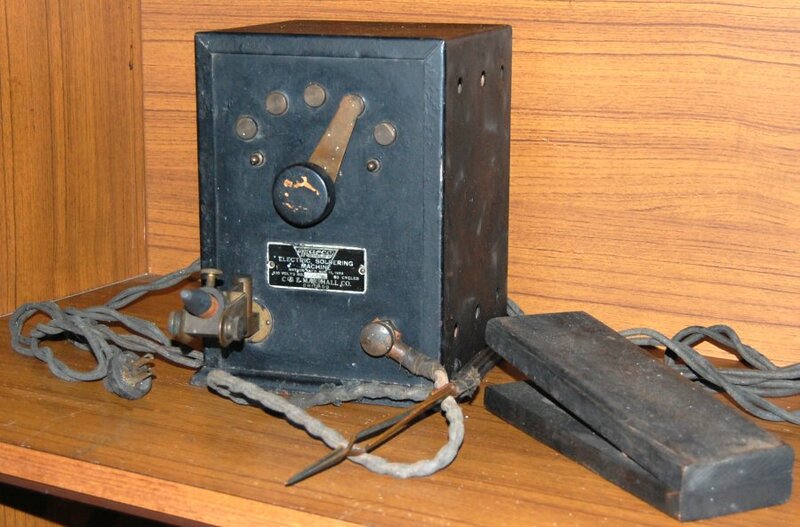 It looks like the transformer housing is home made but the system came with two gun type soldering irons an there is a 1946 advertisment below that lists transformer powered irons. Unfortunately one did not survive shipping in tha same box as the transformeer. 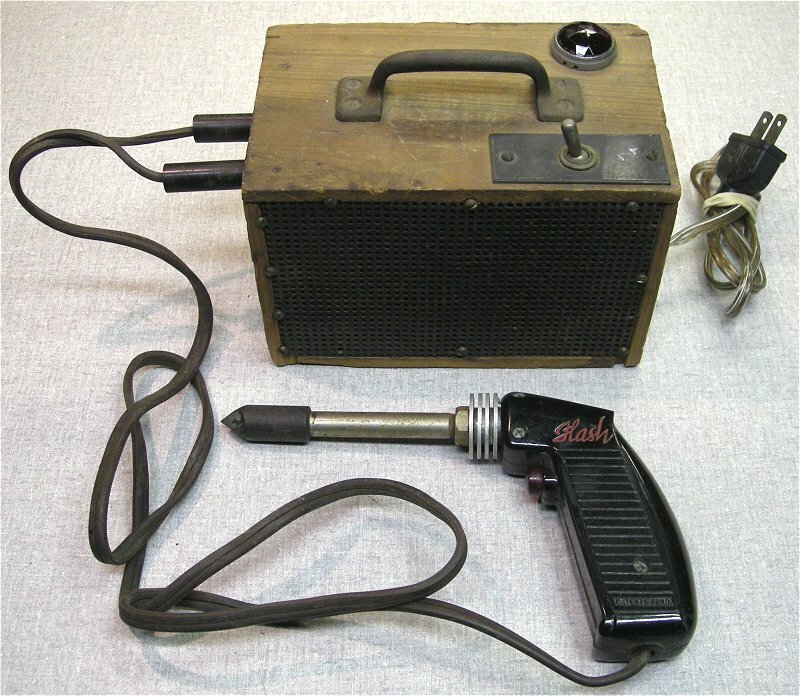 Flash Soldering Irons were manufactured by the Baker-Phillips Co of Minneapolis in the 1940s. 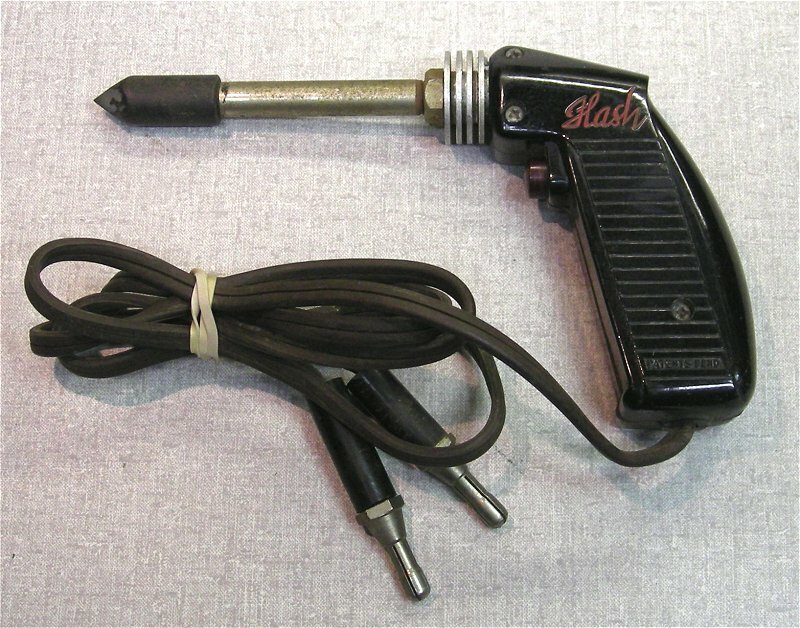 The "Flash" name might be derived from their ray-gun looks. Or maybe they just heat quick. The only markings I can find on these is the "Flash" name on the irons. 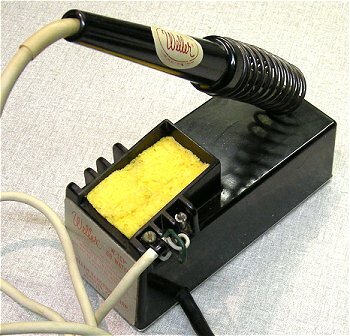 This black Weller model W-TCP was Weller's first soldering Station (around 1967). 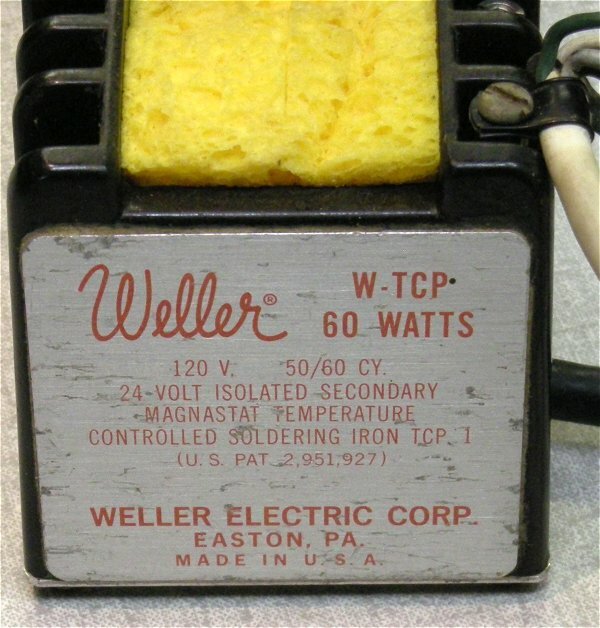 It's 60 watts and used a 24 volt Weller TCP 1 Magnastat iron which was connected to terminals on the top right side of the power supply. 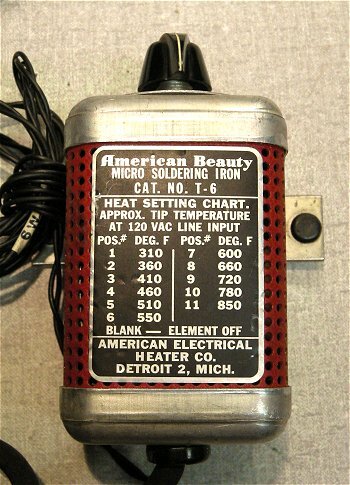 Magnastat tips controlled the temperature and were available in various temperatures. 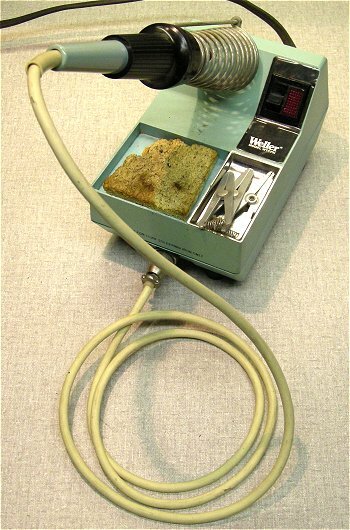 Weller's next version of the W-TCP was green and the iron was connected internally through a hole in the base on the left side. 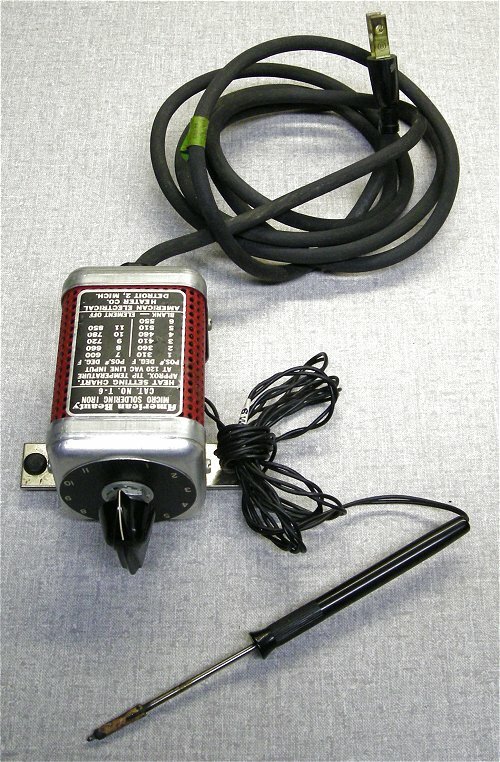 A power switch and light were added to later versions like the WTCP-L (below). This one is still works well after 46 years. 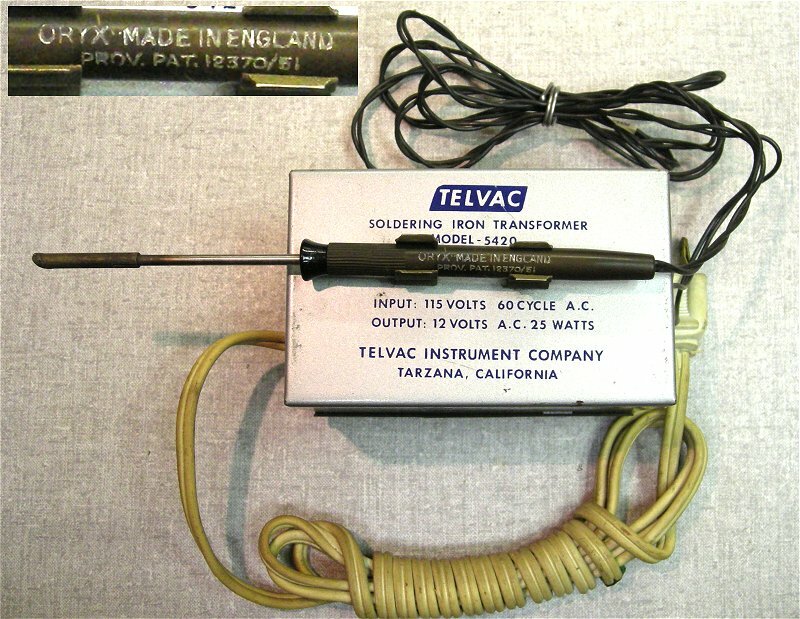 This Telvac 5420 Low Voltage Soldering Iron transformer outputs 12 volts AC. 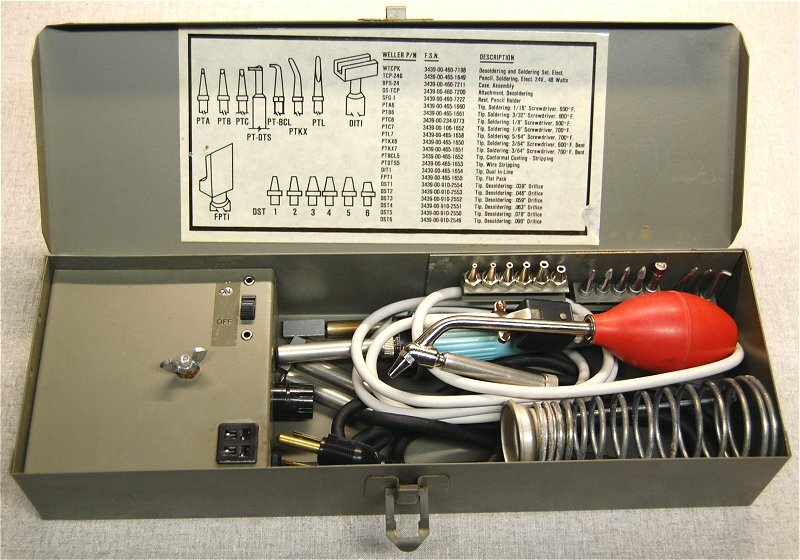 It has an English ORYX light duty pencil soldering iron hooked up to it. 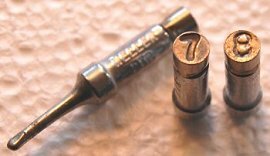 From the style of the tip it was probably designed to hand solder surface mount ICs and components. 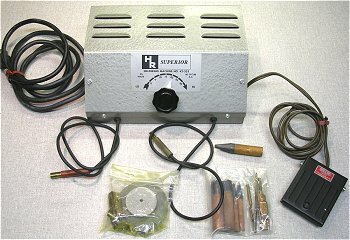 This HR Superior Electric Soldering Machine is a modern version of the electric soldering machine at the top of this page. 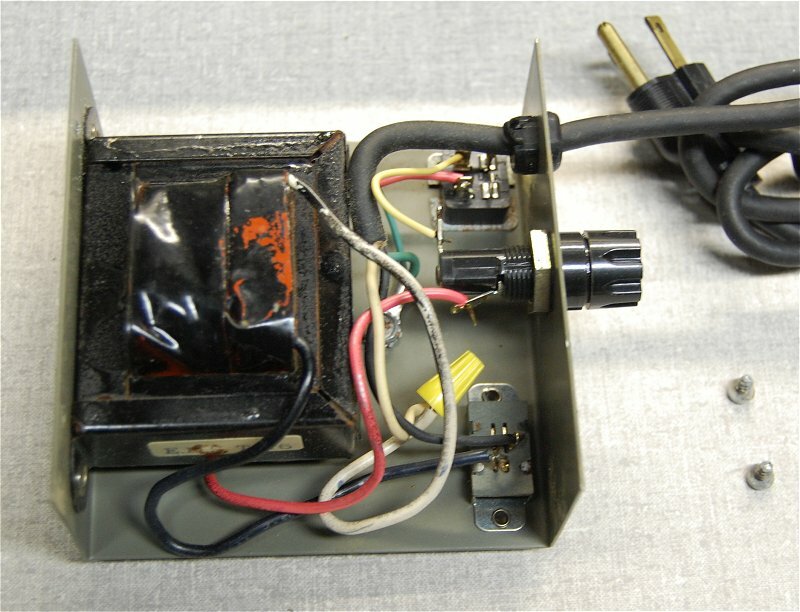 It also uses a carbon with current passing through the item being soldered and turns on and off with a foot pedal. 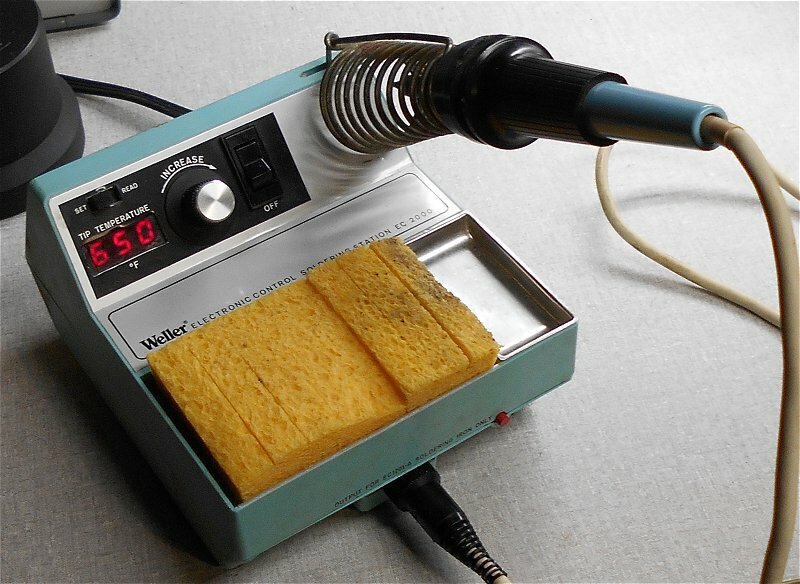 I'm pretty sure it's mainly designed for small work like jewelry making. It has a model number of 42-553 but I don't have any other details on the manufacturer although I have found what looks to be the same unit under many different brand names and offered by jewelry suppliers. This one looks to be new and never assembled or used. The date stamped inside the chassis is July 25, 1977. There is a price sticker on the box for $104.50. 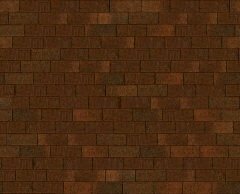 The current ones I have found on line range from $345.00 to $495.00. I'm not sure I'd operate it after looking inside the case.